March 10: It rained on and off during the night, and by morning, it had mostly stopped. But not entirely. A light drizzle persisted and would continue to persist throughout the day. Not hard enough for me to pull out my umbrella, but annoying enough to make everything feel wet. Early in the morning, though, it was largely dry and by the time I reached Woody Gap a couple of hours later, the rain had stopped completely and what little water had fallen on me had dried. Woody Gap is notable because it's the first paved road that crosses the Appalachian Trail, and Amanda was waiting for me when I arrived. I remembered the first time I hiked the trail I was amazed at how fast cars traveled down the road. It was as if it was the first time I had ever seen a car traveling at highway speeds, but this time, it didn't phase me a bit. Amanda provided a couple of Krispy Kreme doughnuts and orange juice which I happily accepted, along with a roast beef sandwich which I took for later. 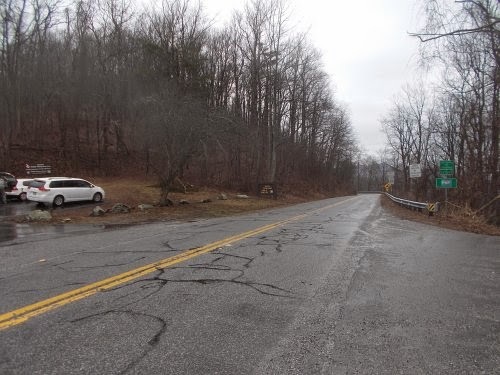 Because Amanda wanted me to go another 11 or so miles to Neels Gap, the next road crossing. She didn't have to twist my arm to make this happen. Although it had been raining and looked like it would start again at any moment, it wasn't a hard rain and the weather forecast for the next few days looked to be much worse. I didn't have to be talked into taking advantage of the mediocre weather for hiking and then take the next few days off for sightseeing off the trail in genuinely bad weather! The fog starts rolling in! I also dropped off some of my gear--no sense in carrying a full pack if Amanda was just going to pick me up again later in the day! I dropped off my sleeping bag, camp clothes and extra food, lightening my load by 5 to 10 pounds. Then off I went. The drizzle started up again, and for about five minutes, it rained hard enough that I finally had to pull out my umbrella. Then the light drizzle returned and I put the umbrella away. 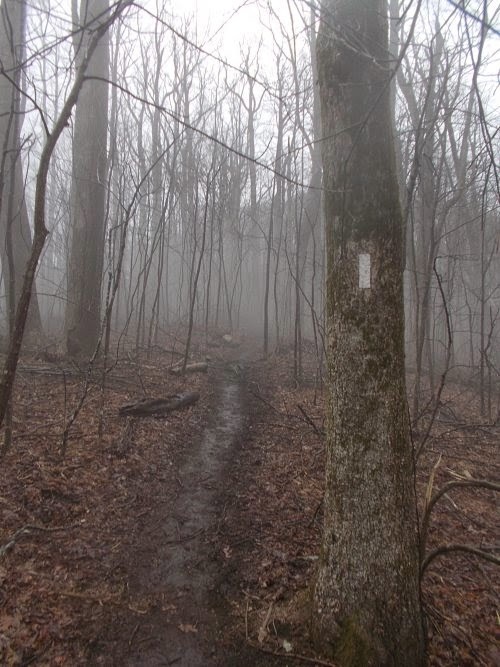 An hour later, the trail entered a thick layer of fog, reducing visibility to perhaps 50 feet. 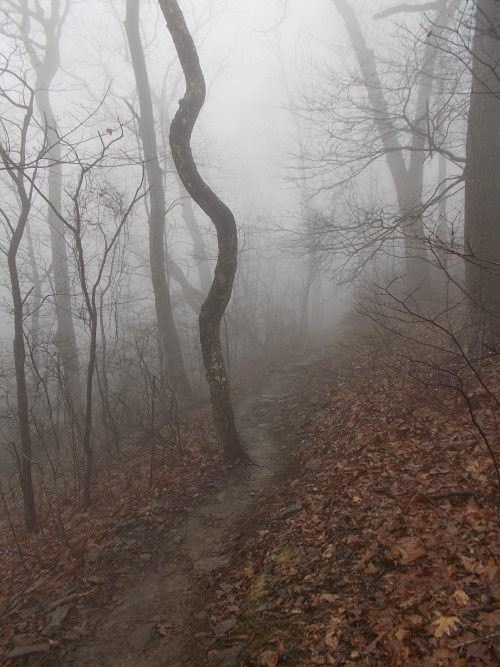 It gave the trail an eerie look and I rather liked the photos I was taking. They had a ghostly feel. Not much happened on the rest of the hike. I stopped at the Woods Hole Shelter for lunch and chatted with a few other hikers who also stopped to eat. Then onward I continued. 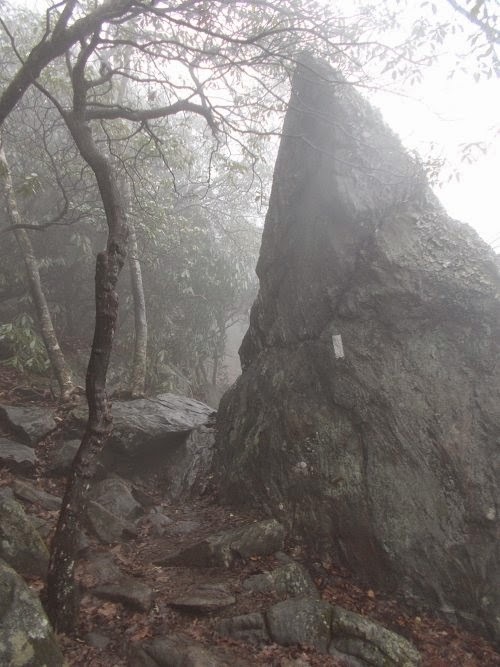 The last section of trail climbed Blood Mountain, the highest point on the AT in Georgia, then dropped down a steep, rocky trail slick from the rain. I'd call it the most treacherous part of the trail so far, but I got down without any sprains or injuries. 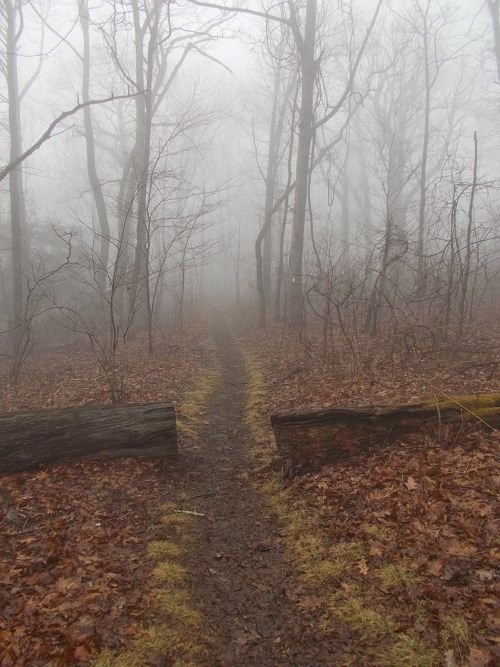 Woody Gap is the first paved road the AT crosses. When I arrived at Neels Gap, Amanda was nowhere to be seen. I told her that I expected to arrive at around 4:00 but made it about 15 minutes early. No problem, though! 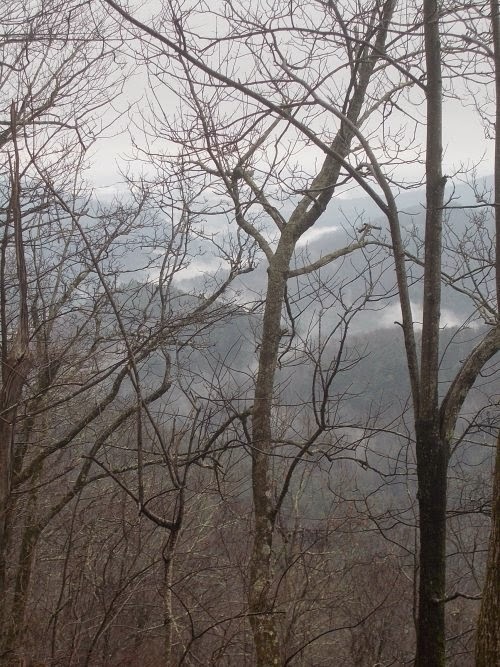 Neels Gap has all sorts of entertainment available because that's where the Walasi-Yi Interpretive Center is located. They provide showers, give hikers a chance to replace bad or overweight gear, provide lodging and just are a place for hikers to hang. A large tree in the yard has hundreds of pairs of old boots hanging off of it. 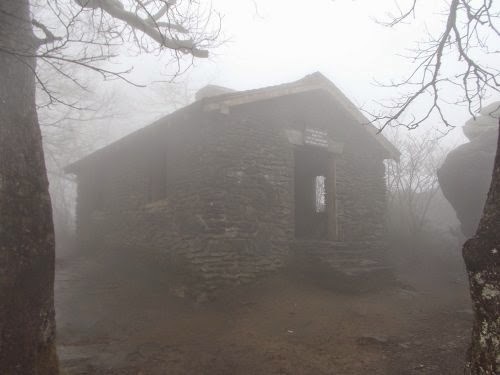 It also has the distinction of being the only place where the Appalachian Trail passes through a man-made structure. Amanda showed up about 10 minutes later. She hadn't been here yet and wanted to go inside to browse, so I threw my pack in the car to follow suit, but headed back when I remembered the passport I acquired at Amicalola Falls. I knew this place would have a stamp for it. Amanda continued on without me. 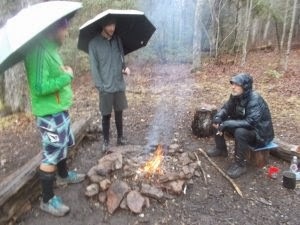 I got my passport and went inside where I was ambushed by Fireneck--a letterboxer and fellow long-distance thru-hiker who's done the Appalachian Trail, Long Trail and Colorado Trail. (I think that's all of the long-distance trails he's done so far.) We had never met before--not in person, at least--but I immediately recognized him from his photos. And I was stunned--how did he know I'd be there just then?! 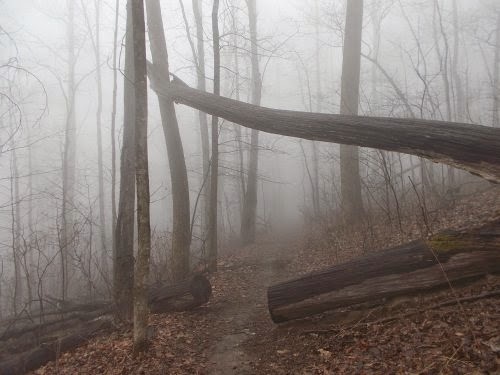 As it turned out, he worked there, and had read that I was starting the Appalachian Trail and keeping his eye open for me knowing I'd have to pass by soon. He never told me he was working there so I had no idea he was even within a thousand miles of me. (I thought he lived in Illinois or Ohio or something!) But it was a really fun surprise. He couldn't talk for long--he was actually working, after all. But we probably chatted for about 5 minutes before he went back to working and Amanda and I browsed the rest of the store. 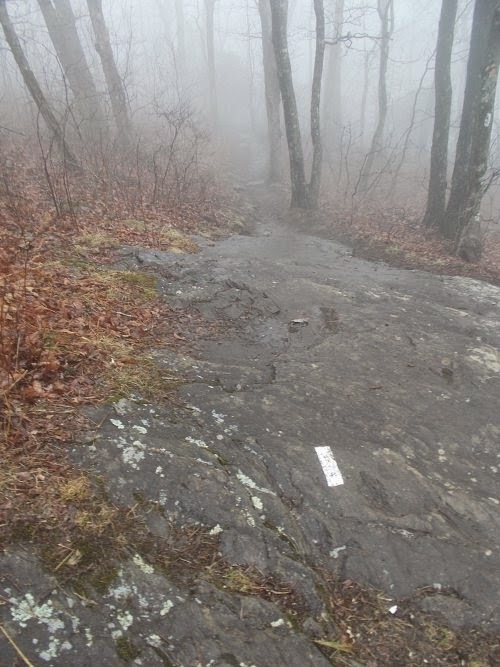 The trail down Blood Mountain is steep and particularly slick when wet! 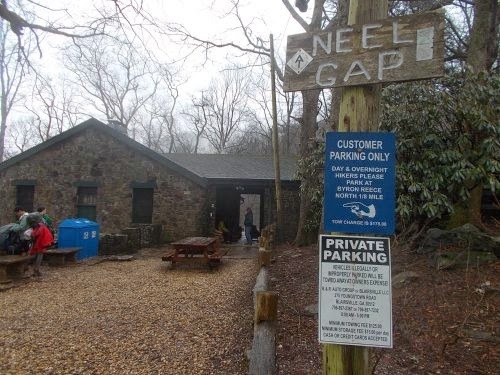 Neels Gap is the only place where the AT passes through a man-made structure. That hole in the building ahead--that's the official AT! 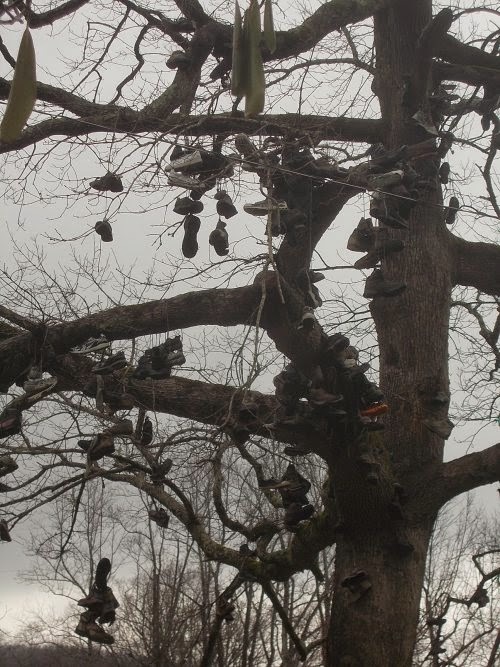 This tree was filled with dangling abandoned shoes! 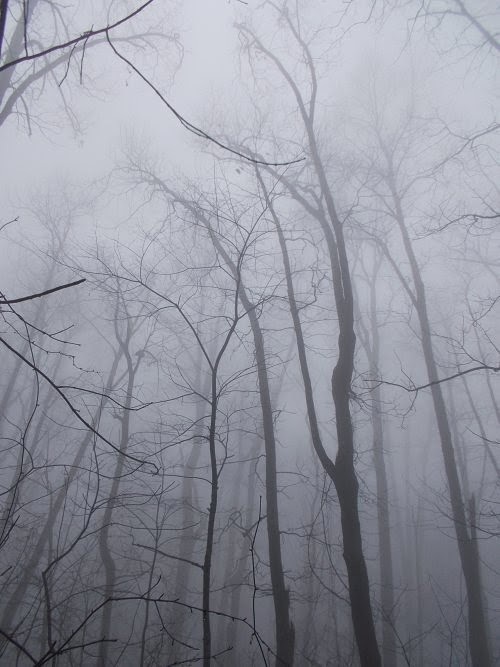 I love the pictures in this post...very eerie! Great photos on a not so great foggy day. At least one of the them, I expect to see King Arthur and his knights before they meet the Knights who say "Ni!"